Although the following is just a rumor, we sure have our fingers crossed hoping that it's on the right track. After all, there's surely a lot of people out there waiting to get a Google Nexus 4 smartphone at all costs. 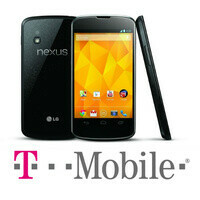 So here's the deal: T-Mobile is expected to have the Google Nexus 4 back in stock in January, and word on the street has it that the new batch will go on sale as early as "tomorrow" (January 9). Reportedly, display units have already arrived at the carrier's retail stores. Keep in mind, however, that not all outlets are guaranteed to get new Google Nexus 4 units. That's all we have for now, and as much as we wish it wasn't so, there's no evidence in support of what you just read. Nevertheless, it won't be long until we know with certainty whether today's rumor holds water. This should be available on all 5 carriers. Pathetic it is taking thing long to get this phone back in stock. hope the website is getting restock soon.... P.S; Guy anyone know what happen to the rumor about the white nexus 4? Is it coming out for real?